takuyazz, you refer to this? yup, so we can actually check-in our baggage and collect our boarding passes at kowloon and hong kong station? All BoutiqueS Apartments near Wan Chai & Causeway Bay MTR. A BoutiqueS Apartment, with Scandinavian Modern Designs. A private washroom with shower. Pantry with fridge, hotplate, kettle and utensils. Free Cable TV (PCCW Now TV) & DVD player. Free Fiber Optic Boardband, HKBN BB1000Mbps on Wi Fi networks. Free Wireless Internet, Access Point At Ever Single Floor!! Let me know at least 3 weeks advance, as the rooms are mostly booked monthly!! 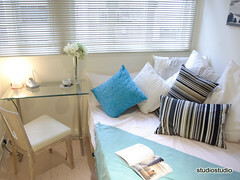 Only HK$400 - 600(Single Bed)/HK$500 - 800(Double Bed) per night. 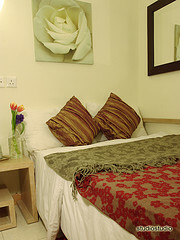 Book 2 Double beds & will get 1 Single Bed Free!! Ferry. 2 minutes walk to Mini Bus Stop (16 Seater Bus) and tram stop (Ding Ding). Lifestyle & Food: Places near or around the apartment, 6 x newstand, 1 x 7/Eleven, 6 x Cha Chang Ting (1 x 24/7 Bigfoot Cha Chang Ting), 1 x Wan Chai Police Station, 2 x Money Changer, 4 x Laundry Shop, 1 x Mahjong Shop, 1 x Mcdonalds at CC Wu Building, 298 Wan Chai Computer Center, Wan Chai Computer Center at Wan Chai MTR, 1 x Ajisen Ramen, All the Banks in Hong Kong along Hennessy Road. If you want to feel what Lifestyles of Hong Kong about, Going for Hoilday, For Business Trip, Concerts, Going for Trade Fairs & Hong Kong View stay at Hong Kong Island. If you like Noisy Places & Human Traffic stay at Mongkok, Kowloon. Once the booking is confirm there will be no change in date/refund even checkout early. If there any enquries you will able to reach my at my email, msn, PM@HWZ, Tel: 65 64922926 or mobile 24/7. Please be reminded that there should not be any advertising message in your posting. I have observed that you have been providing personal contacts and information for commercial purpose which are not allowed under our TOS (Terms Of Service). Yes it's possible. I done it for my CX flight before. Note that if you are flying Jetstar, this service is not available. Last edited by BluBlur; 07-05-2007 at 01:04 AM..
if i check-in, den go out of the station to shop again, will i need to buy a new airport express ticket? 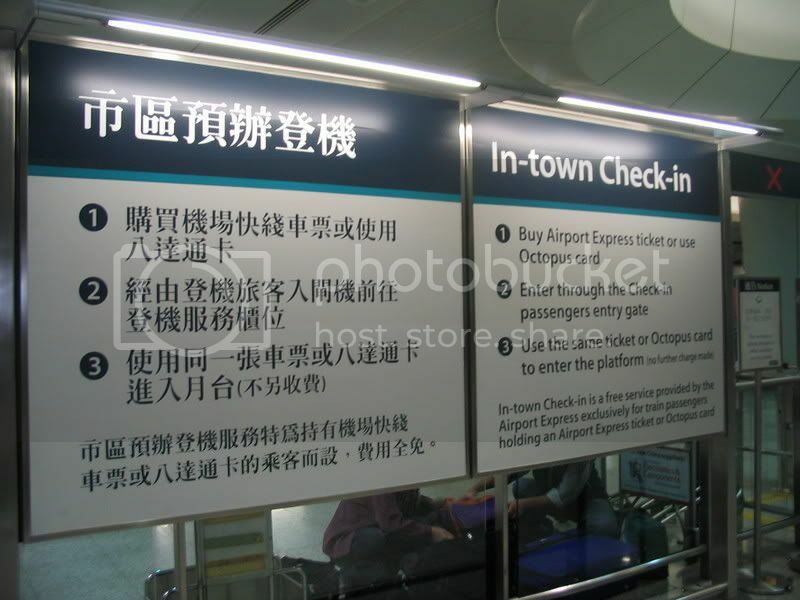 I remembered at Kowloon MTR, I used my Airport Express tix to enter the check-in area. Then used it to exit. Afterwards, I took the lift down onto the platform area, where I used the same tix to enter the boarding area towards Airport. In between the check-in area and platform, you are free to go anywhere. Edit: on a separate note, an Octopus card can be used for check-in area. Then just take the MTR to Tung Cheng, then hail a cab to airport after you've done with your shopping. The total cost should be lower unless you have gotten a round trip AE ticket. Last edited by BluBlur; 07-05-2007 at 12:25 PM..
Just to check what else are there at the nyong ping area? disney is on the same island as tungchung (lantau island). UA, SQ & CX still able to Check In with In-Town Service. All Airport Express ticket single trip are valid for 24 hours. You still able to go out of the station to shop again within 24 hours window. Usually what you can do was. Check in 24hrs earlier or a few hours early and take a cab, mtr, bus to go shopping and then go airport AT LEAST 1.5 - 2 Hours before your flights. Matthew Fam, noted and really sorry. Last edited by qqspot; 07-05-2007 at 05:21 PM..
Found some useful Infomation from HKTB!! Hong Kong Video Clips Find out why Hong Kong tops everybody's list of must-visit destinations in the world! Click here and enjoy our Hong Kong Experiences video. This 9.5-minute video showcases the real Hong Kong featuring its sights and sounds, the culture, the sophistication as well as many of the attractions that have helped make Hong Kong one of the world's top tourist destinations. Watch the video and then start making plans for your trip of a lifetime to Hong Kong! The HKTB and five mobile phone service providers have introduced Hong Kong Mobile Host, an audio tourist information service that lets visitors get instant access to quality tourist information via their mobile phones. For HK$60 you get a Mobile Host PIN Card and 72 hours of unlimited audio access upon activation. Mobile Host also serves as a handy shopping and dining guide. For more information, please contact us or call the HKTB Visitor Hotline at (+852) 2508 1234. May 2007 Newletter About Hong Kong from HKTB!! Just got an email from HKTB regard about May 2007 Events in Hong Kong. in that case, if i am planning a day for a disney trip, probably in the morning and early afternoon. What else can i do in the area? you sure you're not staying to watch the fireworks at disney?